July and August are the months when many woodworkers tend to slack off a bit and abandon the workbench for more outdoor-oriented activities. In spite of this, we haven’t slacked off at The Woodworker’s Journal and have assembled what I think is a pretty impressive collection of projects for this issue. As usual, some are quick and easy and others (like the stunning game/coffee table) are a good challenge. I hope you find more than a few projects to your liking and plenty of helpful woodworking information. I thought your article «Installing Machine Woven Cane» was well done — at least up until the last few paragraphs. At that point we began to differ regarding the use of glue. Removing cane and spline that has been glued in place is not an easy job, even if hide glue, which is water soluble, is used. In addition to state legislation pertaining to liability, there are at least three federal laws that directly affect the craftsmaker. First, there is the Hazardous Substance Label­ing Act as amended by the Child Protection Act of 1966 and the Child Protection and Toy Safety Act of 1969. These statutes were passed in response to the staggering number of injuries and poisonings that occur to children under fifteen each year. Under this law the Federal Trade Commission (F.T.C.) is empowered to name any potentially dangerous substance a hazardous substance. Such substances may not be used in any product that might give a child access to the hazardous substance. That is, no amount of use or abuse by a child should make the product unsafe. Presently banned under this act are jaquirty beans used in necklaces, jewelry and dolls’ eyes. For a list of other hazardous substances you should consult your local office of the F.T.C. The second statute is the Flammable Fabrics Act. This statute empowers the F.T.C. to establish appropriate standards of flammability for the fabrics used in clothing and household products, including children’s toys. In general, the cost of liability insurance is affordable for the small business: $100,000 liability insurance for a person doing up to $10,000 of business a year will cost about $100 annually, although rates will vary from region to region. Craftspeople should consult their insurance brokers or agents to determme the rates in their own particular areas. Each craftsperson must then evaluate this cost against the risks of a law suit. You should know that the majority of these suits are settled for, or are litigated to a judgment of, over $100,000. You can deduct the cost of this kind of insurance as a business expense for tax purposes. Given these factors, you should, if there is any reasonable expectation that a purchaser of your product could sustain personal injury from it, seriously consider obtaining product liability insurance. Asprayed-on finish, properly applied, will result in a smooth and even surface that can’t be easily matched with a brush. Add to that the fact that a piece can be sprayed three to five times faster than it can be coated with a brush and you have a couple of good arguments for considering the purchase of a spray gun — particularly if you do a lot of finishing. Spraying is especially helpful if you regularly finish (or refinish) furniture that includes a lot of spindle turnings — the kind, for example, found on a Colonial Windsor chair. Using a gun, an experienced sprayer can finish three or four of these chairs while a fast brush man will do one. Now slide the square to the rear of the blade (where it emerges from the table insert) and rotate the blade backward until the marked tooth again contacts the square. If the tooth doesn’t touch the square the same amount, the saw blade is obviously out of parallel with the gauge slots. 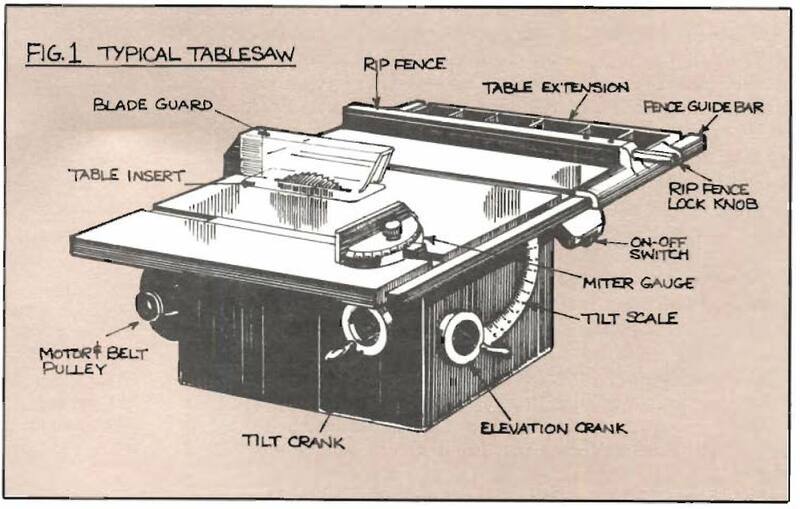 To correct this, trunnion bolts underneath the table, which hold the entire tilt mechanism to the table, must be loosened so that either the front and rear trunnions or the table can be shifted slightly about the axis of the saw blade to bring the blade and table slots parallel. Repeat the check with the square and, if everything looks good, tighten the bolts carefully. After tightening, again check to make sure nothing shifted. While holding the board firmly against the gauge, push the gauge with the right hand, feeding the work slowly and steadily until the cut is complete, then withdraw both the work and the gauge to the front of the table and turn off the motor. You have just completed a basic crosscutting operation used to trim a board to length across the grain at (we hope) 90 degrees to the edges (Fig. 4). Choose a 1 x 6 x 16 in. piece of pine for the test cut and make the first cut (called a face miter) as shown in Fig. 6. Check for accuracy with a combination square. It should be perfect, but if it isn’t, repeat the procedure for adjusting the miter gauge. Turn the miter gauge to the opposite 45 degree setting and make another test cut, using the right-hand table slot and again check the cut with the combination square. Играй только на официальном сайте казино плей фортуна в 2018 .